Preface. Introduction (Y. Sasson). Preparation of Organobrominated Compounds - Synthesis. Regioselective bromination of phenols (H. Eguchi et al.). Bromination of aromatic compounds with alumina-supported copper(II) bromides (M. Kodomari et al.). Bromination and oxidation with benzyltrimethyl ammonium tribromide (S. Kajigaeshi, T. Kakinami). 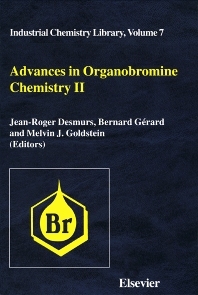 Advances in the synthesis and applications of organobromine compounds (K. Smith). High temperature bromination. IV. Bromination of benzonorbornadiene and benzobarrelene (M. Balci et al.). Bromination of ergolene and ergoline structures - new results (R. Rucman). Thermal rearrangement of hexabromocyclododecane (M. Peled et al.). Preparation of Organobrominated Compounds - Reaction Mechanisms. Stereo-, regio- and chemoselectivity of bromination of ethylenic compounds (M.-F. Ruasse). The fates of bromonium ions in solution: a very short lifetime with many different endings (R.S. Brown). New mechanistic insight into the electrophilic bromination of olefins (G. Bellucci et al.). Use of Organobrominated Compounds - Synthesis. Synthesis of a metabolite of fantofarone (G. Rosseels et al.). 2-Bromoamides. Stereocontrolled substitution and application to the synthesis of compounds of biological interest (F. D'Angeli, P. Marchetti). Asymmetric synthesis of (S)-&agr;-substituted &bgr;-bromo-;&agr;-hydroxy acids (S-S. Jew et al.). Substrate specific reactions of dibromides of &agr;-arylidene-benzocyclanones with azide nucleophile (A. Levai et al.). Organobromine compounds in reactions of homolytic addition and telomerization (A.B. Terent'ev, T.T. Vasil'eva). Bromides in zeolite synthesis/Zeolites in bromide synthesis and conversion (H. van Bekkum). An improved synthesis of biaryl derivatives via the palladium catalyzed coupling of aryl bromides (A. Ewenson et al.). Use of Organobrominated Compounds - Reaction Mechanism. Kinetics and mechanism of decomposition of N-Br-amino acids in alkaline medium (J.M. Antelo et al.). Arylation of hard heteroatomic nucleophiles using bromoarenes substrates and Cu, Ni, Pd-catalysts (H.-J. Cristau, J.R. Desmurs). Hydrogen bromide elimination from diastereomeric 3-bromoflavanones - mechanistic aspects (T. Patonay et al.). Bromide-mediated oxidations of organic compounds (R.A. Sheldon). Industrial Aspects. New catalytic process for bromine recovery (P.F. Schubert et al.). Bromine chloride production: study in a reaction calorimeter (A. Kitron). Influence of bromine containing fire retardants on the processing and properties of plastics (L. Utevskii et al.). Phosphorus-bromine flame retardant synergy in engineering thermoplastics (J. Green). Environment. Treatment of bromide effluent problems with H2O2 technology (K.M. Reeve). Behavior and fate of aromatic bromine compounds in the environment (D. Lenoir). Toxicology. Comparison of hepatotoxicity of monobromo benzenes, dibromobenzenes, hexabromobenzenes and tetrabromobisphenol A (J.A. Szymanska). Analysis. The characterization of polybrominated diphenyl ether (D. Sondack et al.). Analysis of pentaerythritols and brominated derivatives (D. Sondack et al.). Author Index. Subject Index. The organic molecules that are used, particularly in the areas of pharmacy and agrochemicals, are becoming more and more complex both in their chemical nature and spacial configuration. A complex molecular structure is inevitably fragile; it cannot be produced under severe conditions (in particular high pressure and temperature). In addition there is a problem of the scale-up of a product from the laboratory to the industrial scale. The control of the reactivity, selectivity, and yield and the use of sufficiently mild industrial conditions are all factors that must be taken into account by industrial chemists. Amongst the tools giving controllable reactivity, selectivity, and relatively mild reaction conditions is bromine. The organic chemistry of bromine sometimes gives surprising selectivities compared to those of chlorine. This volume which is based on Orgabrom '93, brings together the main contributions presented at this event.